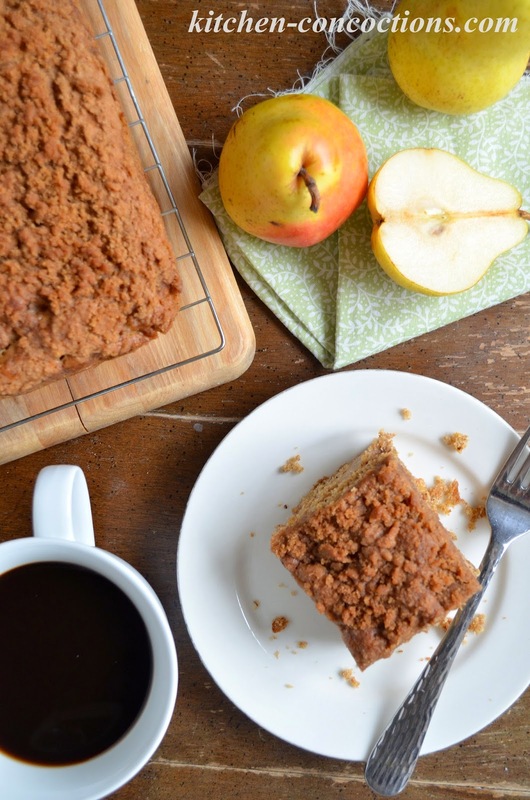 Whip up this Spiced Pear Crumb Cake, filled with warm fall spices and fresh seasonal pears, and serve it with a cup of freshly brewed coffee for breakfast or an afternoon treat! Working in the food industry for so many years, I find it fascinating the food trends that have come and gone over the years. From the dump and cook casseroles popular in the 50’s and 60’s, to Jell-O salad in the 70’s to the uber healthy diets and food trends I know of today. In recent years, bacon covered anything and everything has been all the rage (and honestly, despite my extreme love of bacon, one fad I hope retires soon…. gasp! ), to specialty cupcake bakeries and the common burnt brown butter phenomenon. Believe it or not, fads even come and go with fresh, pure fruits and vegetables! There are entire Hatch Chile festivals, pick your own strawberry farms, oh and let’s not forget the kale craze! In fact, my mother-in-law thinks its insane that people are so obsessed with kale. Whenever she sees kale on the menu she says that 15-20 years ago, when she was a manager of a grocery store, the only thing kale was ever used for was to garnish the deli platters! And every season the food fads continue. Summer it’s all about that base, er, watermelon, fresh corn and peaches. Then when fall rolls around people can’t get enough pumpkin and apples. While I love pumpkin and apples (especially this year) just as much as everyone else in the universe, what about all those other fall fruits and veggies that get little or no attention. Like leeks, parsnips, persimmons, rutabagas and pears. Yeah, I know. I am sure for many these fruits and vegetables make an appearance in your kitchen often throughout the season, but I feel like they need a bit more attention of their own. While I was apple crazy at the beginning of fall, my obsession quickly turned to sweet, juicy pears. You are probably thinking, Pears? Really? and you are right, pears are very common, but in the mix of apples and pumpkin EVERYTHING I think most people don’t give pears the love they deserve. 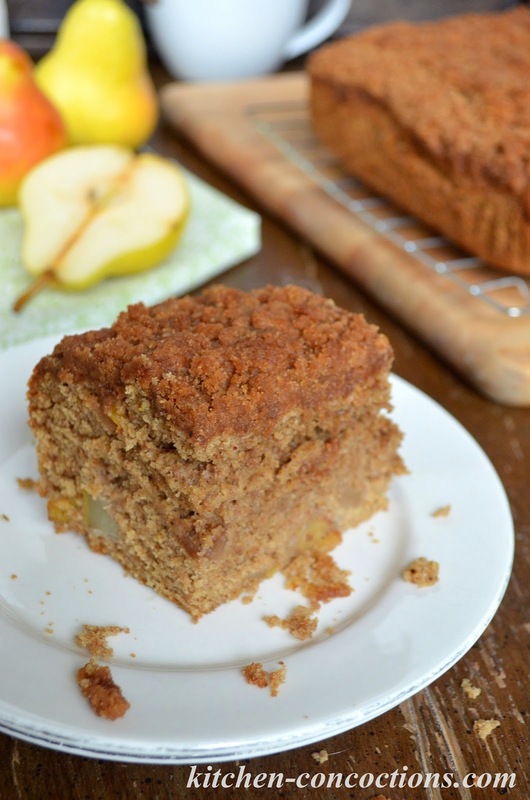 This Spiced Pear Crumb Cake is a beautiful way to feature pears in a sweet breakfast treat. 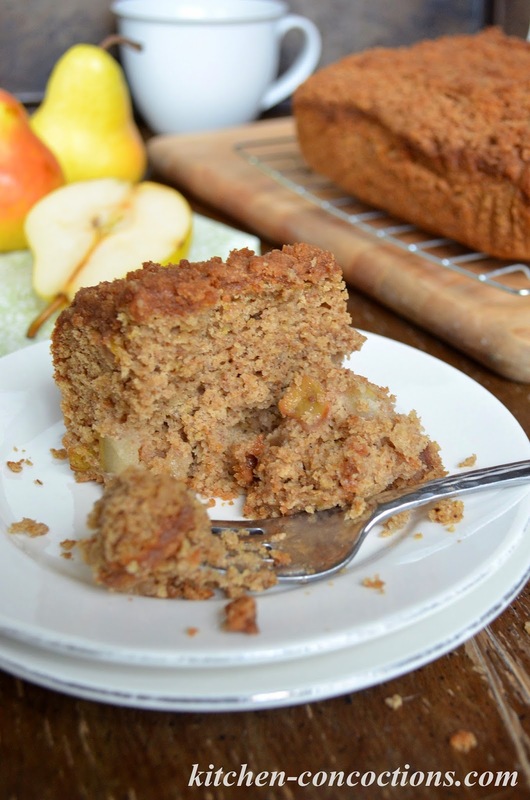 This cake is super moist, has a fantastic blend of fall spices, a picture perfect crumb topping and is dense with fresh, delicious fall pears. What is one food fad you want to see go?? 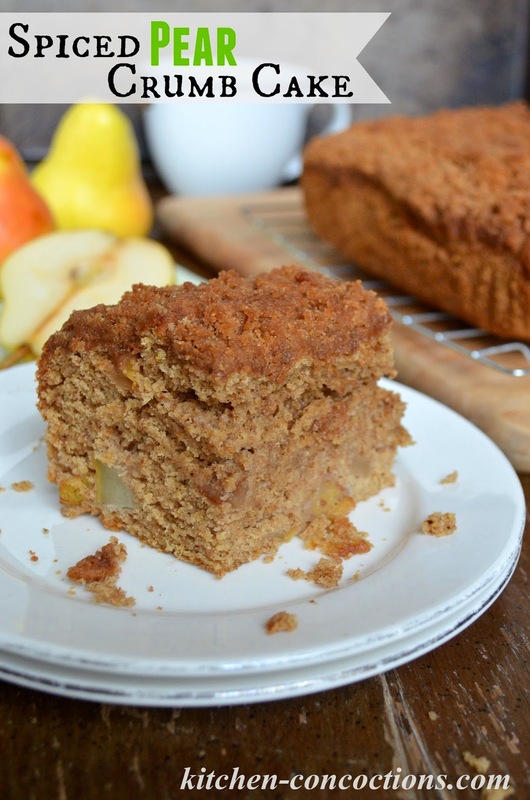 A moist and tender coffee cake filled with warm fall spices and fresh seasonal pears. Preheat oven to 350 degrees F. Grease or line with parchment paper an 8×8-inch square and set aside. In a large bowl, stir together both flours, baking powder, baking soda, salt, and spices. Stir in both sugars, stirring until well combined. Set aside. In a medium bowl, whisk together melted butter, eggs, buttermilk, and both extracts. Slowly stir the wet ingredients into the dry ingredients, stirring until well combined. In a small bowl toss chopped pears with one tablespoon unbleached all-purpose flour. 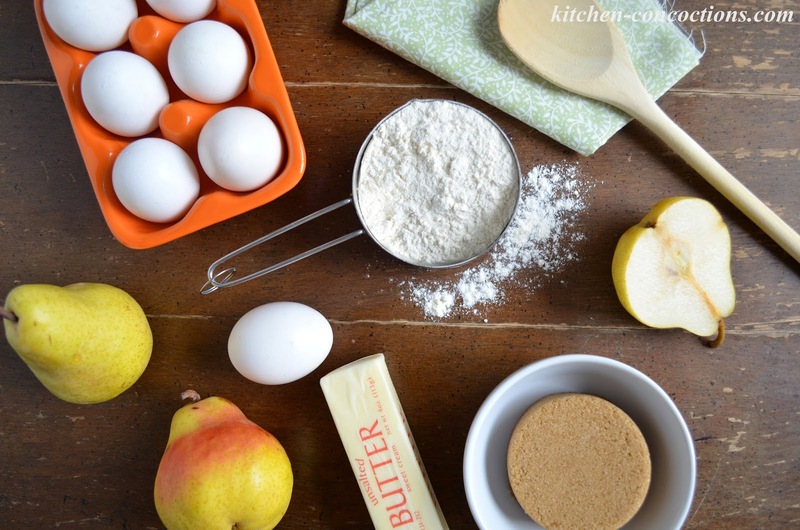 Carefully fold flour coated pears into prepared cake batter. Pour batter into prepared pan. To make the crumb topping, combine unbleached all-purpose flour, brown sugar, salt and spices in a medium bowl. With a pastry cutter, fork or your fingers, cut butter into flour/sugar mixture until mixture becomes coarse and crumbly. Generously sprinkle crumb topping on top of cake batter in pan. Bake for 25 to 35 minutes or until a skewer inserted in the cake comes out clean. Remove from the oven and allow to cool for at least 30 minutes before serving. Cake will last for 3-4 days, wrapped well and stored in the refrigerator.